The UK is biding its time this month. Whilst the March reading of the Accountagility Index (AAX) saw a second successive fall, the value of the drop to 5.16 from 5.19 was only 3 basis points. The Index records UK political and economic health in a score out of ten, and any score above 5.00 is positive. The Brexit process is still a source of worry for many, and recent statements by EU and UK spokespersons pinpoint significant differences between the sides. Depending on your viewpoint, it is either “EU bullying” or “lack of clarity in the UK stance”. 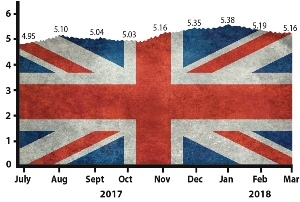 Other measures of note this time are signs that the stubborn inflationary hump may be past its peak, and a healthy reduction in the UK debt ratio as government income increases. Putting a magnifying glass to the sentiment changes is illuminating. There was a faster rise in Services orders, leading to job creation, with business-to-business sales growth prominent. On the flipside, manufacturers’ confidence has been falling since last November; yet even here there is good news as orders from export markets like USA, China and Europe are up (not that you would see this based on the headlines). Construction companies are fretting about cost pressures, but are seeing a small increase in output. In summary, another month of a colourful patchwork quilt! Next month, will we see a spring in the step or will we be dancing with an April fool? Will the Brexit music start? How will failures in the High Street and in the outsourcing sector affect the tempo?